Back when the WWE went by the name WWF, we were treated to many memorable games on our various home consoles. The more prominent releases that we saw in the post-NES era were those of the “Super Wrestlemania” series, which spawned a couple of sequels. These games were great, but after awhile they became stale and predictable. Released at a time when the WWF was reeling from the departure of many of it’s 80’s stars like Hulk Hogan, it was also a time when games like NBA Jam and Mortal Kombat ruled the arcades. 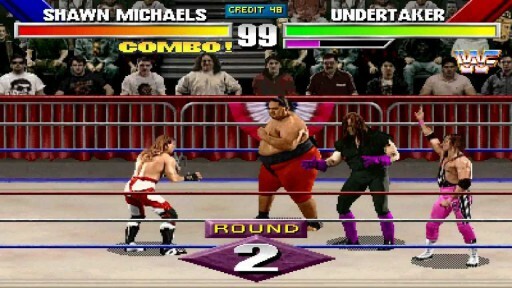 The WWF took a cue from these red-hot arcade properties and partnered up with Midway to release this quasi-hybrid wrestling and fighting game. What follows is the product of that weird time period between the Hogan Era and the Attitude Era, combined with arcade trends of the day. 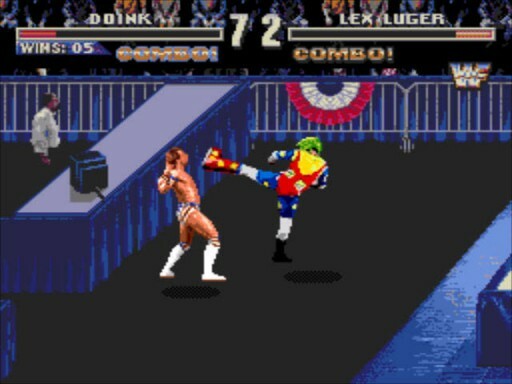 Like I mentioned above, WWF The Arcade Game is much more of a fighting game than it is a wrestling game. This may have left many people disappointed when they played it for the first time, as the game was a radical departure from what gamers had come to expect from wrestling games. It was a bold move, for sure, and led to what could have been a very interesting concept, had it been marketed properly. Instead of a traditional wrestling match, each bout is comprised of a best 2 out of 3 round type match, just like in Street Fighter or Mortal Kombat. The combat style also was modeled after popular fighting games. For example, each wrestler had projectile attacks, uppercuts that would knock the opponent sky high, and the combatants ‘bled’ objects that pertained to their character. The Undertaker would ‘bleed’ bones and skulls, Bret Hart would ‘bleed’ hearts, etc. The action was more fast-paced than its predecessors, as well. The graphics were a step above the previous WWF entries as well, featuring digitized images of each wrestler, all of which were painstakingly recreated via motion capture. The animations were very well done, which led to a smooth pace and fluid movement of players in each match. 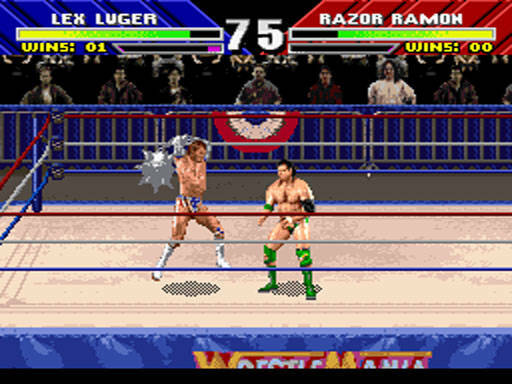 The ring was attractive and well scaled to the wrestlers, and the crowd, a longtime issue in not only wrestling games, but sports games as a whole, were up to par with other games of its time period. Each wrestler’s music was well-represented on all platforms as well. The BGM left a little much to be desired, especially on the SNES version of the game. Sound bytes of then-WWF announcers Jerry “The King” Lawler and Vince McMahon were well done. The Sega Saturn and Playstation versions featured even more of this than the 16-bit releases did. The sound effects were crisp and clear as well. The controls were quite responsive, but to players who came in expecting a wrestling game rather than a fighting game may have found the controls to be rather stiff. Once you got used to the new combat style and game format, most fighting game fans did quite well. The gulf between the control scheme of this game and it’s predecessor, WWF Raw, is enormous. A complete overhaul, that quite possibly alienated many fans. The programmer’s imaginations ran wild with the concept of a wrestling/fighting game, with many unique and imaginative attacks for each combatant. For example, The Undertaker would crack you over the head with an actual tombstone, Lex Luger would crush opponents with a steel mace that morphed from his arms, and for some reason, Shawn Michaels would hit opponents in the face with a baseball bat. The depth of the game is what I found to be lacking, then and now. 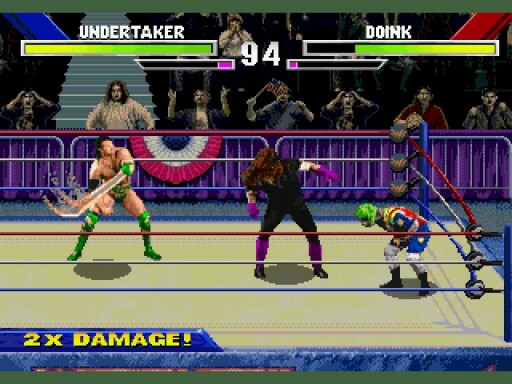 The Genesis and SNES versions of the game only featured 6 wrestlers on the roster, which resulted in a ton of ‘mirror matches’ during the single player game. There was also a lot of slowdown on the 16-bit versions when there were 3 wrestlers fighting in the ring at once. The Saturn and Playstation versions beefed up the roster to 8 combatants, but even then the roster, already weakened by popular favorites like Hogan and Macho Man not being part of the WWF, still looked a little thin. 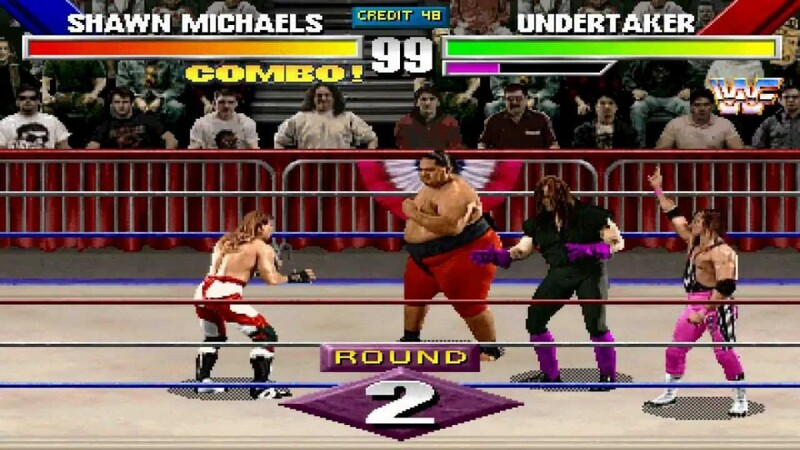 While I realize that the original Street Fighter II and Mortal Kombat also only featured 8 fighters, with a universe as wide as the WWF, only 8 wrestlers did not accurately represent the scope of the WWF’s talent. There was a multiplayer mode, but the single player mode only offered two options, the Heavyweight Championship quest mode, and the Intercontinental Championship quest mode. Looking back, there was no real reason not to feature other modes of play, such as a time trial or survival mode. This could have supplemented the long-term playability of the game immensely. Needless to say, back when this game was released, it more or less qualified as a weekend rental, nothing more, nothing less. The idea behind the game looks and sounds fun, but while the overall execution was well done, the lack of depth is what I think ultimately doomed this game to failure. The radical departure of format most likely caused fans to not respond to this game like previous releases, and left many fans disappointed. That’s a shame, because this was a very fun idea that had so much potential. Fortunately, for wrestling fans and gamers, the THQ wrestling games that helped make the N64 popular were just around the corner. Dragon Star Varnir – Coming to the PS4! Just Dance 2019 – Crazy Carnival update out now! I played a ton of this on the Genesis and the PC back in the day. I had this and In Your House on the PC and I actually preferred the PC versions to the PS1 versions a friend had. Midway took the already over-the-top big personalities of mid 90’s WWF and did to wrestling what they did to basketball with NBA JAM or football with NFL Blitz. 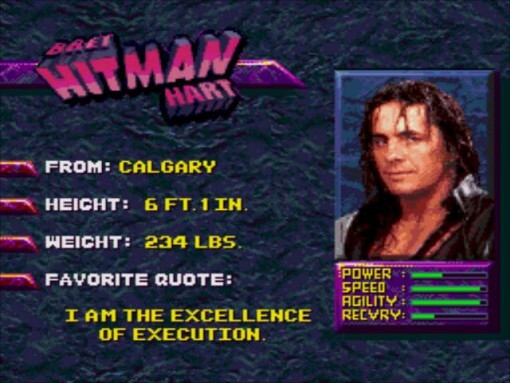 I always liked playing as either Shawn Michaels or the Undertaker.